Tri-layer, heavyweight greenhouse film is black on one side and white on the other. 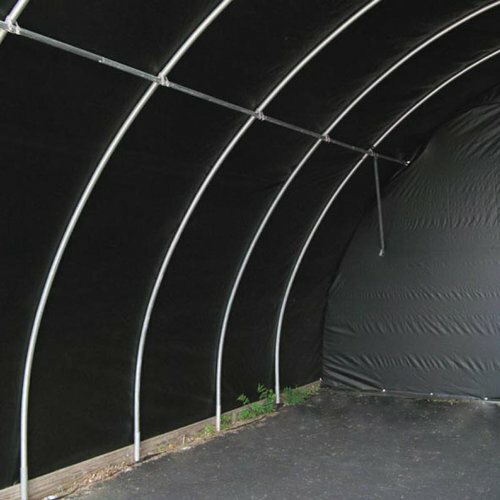 Primarily used as a reflective cover in vegetable production, it can also be used to create a blackout environment. • 5 mil, 18 month, tri-layer Black/White film is UV stabilized to last up to 2 full years when used under greenhouse roof. • Excellent tear and puncture resistance. • Use as either a reflective ground cover or to create a black out environment. • Acts as an effective weed and moisture barrier, providing 100% opacity. • Airtight animal feed storage cover ensures optimal preservation of nutrients through maximum opacity to sunlight, with a high oxygen barrier. • Available in full rolls only. When used with the white surface away from the crop, film provides maximum light blockage. Control the photo period of greenhouse crops for selected plant species, such as orchids and other tropical plants and flowers, to imitate flower bud production. Keeps the plant environment warm, maintains better heat distribution, without heat buildup or stress and will reduce your energy costs. We recommend two layers of black out film for best results. Reflects light to lower leaves for more efficient use of greenhouse transmitted light for both ground and bench crops. When used in vegetable production as a reflective ground cover, it has been proven to increase tomato yields by 27%. Crops grown in conjunction with reflective film covers have lower root zone temperatures, which is very important during summer production. If you have any questions about this product by FarmTek, contact us by completing and submitting the form below. If you are looking for a specif part number, please include it with your message.